It has been said recently that Doctor Faggioli is the go-to person for a plethora of information on the resignation of Pope Benedict XVI and the election of Pope Francis. Massimo Faggioli received his Ph.D from the University of Turin, Italy. He then moved to Boston and was a visiting fellow at the Jesuit Institute at Boston College. Currently he is Director of the Institute for Catholicism and Citizenship at St. Thomas University in Minnesota. He has published several books as well as newspaper and journal articles in Italy and the United States. In addition to teaching and writing, Faggioli works with reporters in their quest for accurate information on all things Vatican. He sees this as an important task for an historian. He tells his students, "to understand what is happening today, you also need to understand the history." Father Thomas Reese is senior analyst for National Catholic Reporter. Reese is often cited by journalists and contributes his writings to secular as well as religious publications. Father Reese entered the Society of Jesus in 1962 and was ordained in 1974. He was educated at St. Louis University as well as the Jesuit School of theology in Berkeley, California. He earned his Ph.D in political science at the University of California, Berkeley. He worked for America magazine for many years. While a senior fellow at the Woodstock Theological Center (1978-85 & 1998-05), Father Reese wrote a trilogy on the organization and politics of the Church. Father Reese’s expertise was recognized by President Obama when he was appointed to the U.S. Commission on International Religious Freedom. This Commission is a bipartisan group which reviews the facts and circumstances of religious freedom violations worldwide, and makes policy recommendations to the President, the Secretary of State and Congress. Saturday, November 7, 2015 at 10:00 a.m.
Father Martin is a Jesuit priest, author and editor at large at America magazine, the national Catholic review. After entering the Society of Jesus in 1988, he ministered in hospitals, as well as to street gang members in Chicago. As part of his formation for the priesthood, he worked for two years in East Africa with refugees. Father Martin began his graduate theology studies at Boston College where he received his Master’s degree in divinity and a year later his Master’s in theology. He holds honorary Doctor of Divinity degrees from Wagner College and Doctor of Humane Letters from Wheeling Jesuit University in West Virginia as well as other honorary degrees. Father Martin has authored many books, often using humor to share his profound love of Jesus and the Church. He has been a guest on television news as well as late night programming, most notably as Chaplain of "The Colbert Report." He also speaks at conferences, universities and on national radio programs. He leads seminars and directs retreats and has taught at Boston College’s Summer Institute. In 2013 he was invited by the U.S. Catholic Bishops to speak at World Youth Day in Rio de Janeiro. "Evangelical Catholicism: The Future of the Church in the United States"
George Weigel is Distinguished Senior Fellow of Washington's Ethics and Public Policy Center and one of the world's leading experts on the Catholic Church. The author of twenty-two books, including the best-selling, two-volume biography of Pope John Paul II ("Witness to Hope" and "The End and the Beginning"), he is also Senior Vatican Analyst for NBC News. 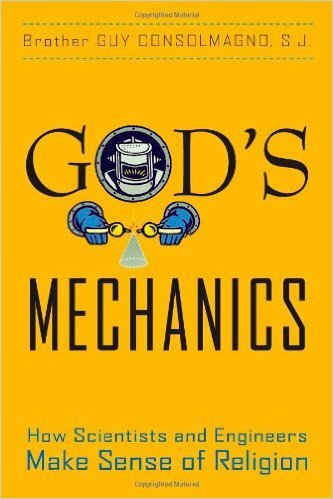 Other books written by George Weigel can be found on Amazon's George Weigel Author page. Current publications - Visit the Ethics and Public Policy Center. George Weigel, papal biographer and Distinguished Senior Fellow at the Ethics and Public Policy Center, delivers his talk, "Evangelical Catholicism and Catholic Higher Education". Mr. Weigel's talk was a part of the Distinguished Speakers Series at Franciscan University of Steubenville. "The Heavens Proclaim: Astronomy and the Vatican"
The Heavens Proclaim: Astronomy and the Vatican - The roots of the Vatican Observatory go back to the Gregorian Reform of the Calendar in 1582, and it has been part of an extensive history of Church support for astronomy (Galileo to the contrary!) Its modern mission for the last hundred years is to show there is no inherent conflict between science and religion by simply being people supported by the Church whose sole mission is to "do good science". We'll look into the history of this activity, including a summary of what's being done at the Vatican Observatory today. Brother Guy Consolmagno SJ, a Jesuit brother, is Director of the Vatican Observatory and the President of the Vatican Observatory Foundation. He studies planets, meteorites and asteroids. He is a native of Detroit, Michigan, received SM and SM degrees from MIT, and earned his PhD in Planetary Sciences from the University of Arizona in 1978. Along with more than 200 scientific publications, he is the author of six popular astronomy books. In 2014 he received the Carl Sagan Medal from the American Astronomical Society Division for Planetary Sciences for excellence in public communication in planetary sciences. An interview with Jesuit Brother Guy J. Consolmagno, a research astronomer at the Vatican Observatory. Brother Consolmagno speaks on the relationship between science and faith. What is the Vatican Observatory, and why does the Vatican have a modern telescope in southern Arizona? John L. Allen Jr. is associate editor of The Boston Globe after 16 years as the prize-winning Senior Correspondent for the National Catholic Reporter. He also serves as the Senior Vatican Analyst for CNN. He’s the author of seven best-selling books on the Vatican and Catholic affairs, and writes frequently on the Church for major national and international publications. He’s also a popular speaker on Catholic affairs, both in the United States and abroad. Allen’s work is admired across ideological divides. The late Liberal commentator, Fr. Andrew Greeley, called his writing “indispensable,” while the late Fr. Richard John Neuhaus, a conservative, called Allen’s reporting “possibly the best source of information on the Vatican published in the United States.” His weekly internet column, “All Things Catholic,” is widely read as a source of insight on the global Church. Allen’s most recent book is The Global War on Christians: Dispatches from the Front Lines of Anti-Christian Persecution. John divides his time between Rome and his home in Denver, Colorado. He grew up in Western Kansas, and holds a Master’s degree in Religious Studies from the University of Kansas. Presenting: "Common Good, Uncommon Excellence"
Christ reminded us that He is in our neighbors and that our love for them represents our love for Him. In Catholic Relief Service's outreach to the poorest and most vulnerable, CRS is committed to excellence as their beneficiaries are entrusted to them and deserve their very best. Dr. Woo's presentation will highlight sustainable and innovative solutions for building up lives and livelihoods. Dr. Woo's Catholic News Service monthly column took first place in the 2013 Catholic Press Association Awards in the category of Best Regular Column - Spiritual Life. Before coming to CRS, Dr. Woo served from 1997-2011 as dean of the University of Notre Dame's Mendoza College of Business. She was a recipient of honorary doctorates from Providence College, University of St. Francis, Lewis University, as well as the University of Notre Dame. She was the first female dean to chair the accreditation body for business schools (AACSB: Association to Advance Collegiate Schools of Business) and directed its initiative for Peace through Commerce. Working for a Better World is an engrossing account not only of Dr. Woo's own life, but of the ongoing critical work of CRS in meeting the needs of the poor, the traumatized, and the needy throughout the world. From typhoon-flattened cities in the Philippines to earthquake-devastated Haiti, CRS is there before the TV cameras arrive adn there after they leave. And CRS is there in over 100 countries helping subsistence farmers and health-care workers, orphans and refugees in those neglected places where the cameras never come. Purchase on Amazon by clicking book cover. Columns: "Our Global Family" - a monthly column for Catholic News Service which is available to the Catholic media. Read Dr. Woo's columns here. "Spirituality in the Year of Mercy"
Ronald Rolheiser, a Roman Catholic priest and member of the Missionary Oblates of Mary Immaculate, is President of the Oblate School of Theology in San Antonio, Texas. He is a community-builder, lecturer, and writer. His books are popular throughout the English-speaking world and have now been translated into many languages. His weekly column is carried by more than 80 newspapers worldwide. Prior to this present position, he taught theology and philosophy at Newman Theological College in Edmonton, Alberta, for 16 years, served as Provincial Superior of his Oblate Province for six years, and served on the General Council for the Oblates in Rome for six years. He has been at Oblate School of theology since 2005. Presenting: "Jesus, the Jewish Storyteller: Of Pearls and Prodigals"
Join Dr. Amy-Jill Levine for a fascinating and thought-provoking talk. Jesus was a skilled storyteller who used examples from everyday life to speak about economics and politics, family values and social concerns, justice and compassion. But, removed from their historic setting in first-century Galilee and Judea, contemporary interpretations of Jesus' parables may lose their original provocation and the genius of his teaching. Levine will discuss the historical context of his teachings, in particular Judaism and the Jewish scriptures that shaped his stories. Amy-Jill Levine is University Professor of New Testament and Jewish Studies, E. Rhodes and Leona B. Carpenter Professor of New Testament Studies, and Professor of Jewish Studies at Vanderbilt Divinity School and College of Arts and Science; she is also Affiliated Professor, Centre for the Study of Jewish-Christian Relations, Cambridge UK. Her books include The Misunderstood Jew: The Church and the Scandal of the Jewish Jesus; The Meaning of the Bible: What the Jewish Scriptures and the Christian Old Testament Can Teach Us (co-authored with Douglas Knight); and The New Testament, Methods and Meanings (co-authored with Warren Carter). Her most recent volume is Short Stories by Jesus: The Enigmatic Parables of a Controversial Rabbi. Dr. Levine is also the co-editor of the Jewish Annotated New Testament. Holding the B.A. from Smith College, and the M.A. and Ph.D. from Duke University, she has honorary doctorates from the University of Richmond, the Episcopal Theological Seminary of the Southwest, the University of South Carolina-Upstate, Drury University, Christian Theological Seminary, and Franklin College. A self-described Yankee Jewish feminist, Professor Levine is a member of Congregation Sherith Israel, an Orthodox Synagogue in Nashville, although she is often quite unorthodox. Presenting: "The Work of Hope: A conversation on breaking the cycle of trauma and violence with youth." Gain a deeper insight into the unconditional love of Christ, lived and explored by Fr. Putthoff and Fr. Boyle, as they have worked to heal and transform communities struggling with poverty and despair. Learn about the importance and practical necessity of bringing hope to young people suffering from poverty and violence. Explore the practical ways that people of faith can bring hope and healing to communities in need, especially to young people. Get inspired with new ideas and insights for yourself and your parish's social outreach to our local communities in need. Fr. Putthoff spent 16 years building Hopeworks 'N Camden in Camden, NJ, an organization that uses trauma informed care to train youth, ages 14-23, in website design, Geographic Information Systems (GIS), and Salesforce technology. As the founder and executive director of the organization, Fr. Putthoff cultivated the relationships and created the framework for the organization that included three social enterprises. Hopeworks has worked with over 3,000 youth in one of the poorest and most under served communities in America to transform their lives. Hopeworks youth have gained real-world work experience through using their technical training and skills with over 450 business clients. Many of the youth have gone on to earn their GED, attain internships and attend and complete college, and find rewarding jobs. In addition to building an innovative and effective non-profit organization for youth, Fr. Putthoff has also served as an Ignation Retreat Director in Philadelphia, PA, an associate pastor at Holy Name Parish in Camden, NJ, and a high school teacher at St. Louis University High School in St. Louis, MO. He has a Bachelor of Philosphy from St. Louis University and four master's degrees: a Master in Organizational Dynamics from the University of Pennsylvania; a Master of Theology from Weston School of Theology; a Master of Divinity, also from Weston School of Theology; and a Master of English from Loyola University, Chicago. Fr. Greg Boyle is the founder of Homeboy Industries in Los Angeles, CA. From 1986 to 1992 Father Boyle served as pastor of Dolores Mission Church, then the poorest Catholic parish in Los Angeles, located between two large public housing projects with the highest concentration of gang activity in the city. Father Boyle witnessed the devastating impact of gang violence on his community during what he has called "the decade of death" that began in the late 1980s. In the face of law enforcement tactics and criminal justice policies of suppression and mass incarceration as the means to end gang violence, Father Boyle and parish and community members adopted what was a radical approach at the time: treat gang members as human beings. By 1988, they started what would eventually become Homeboy Industries, now the largest gang intervention, rehabilitation, and re-entry program in the world. Homeboy employs and trains former gang members in a range of social enterprises, as well as provides critical services to over 10,000 men and women who walk through its doors every year seeking a better life. Father Boyle is the author of the 2010 New York Times bestseller Tattoos on the Heart: The Power of Boundless Compassion. His new book, Barking to the Choir: The Power of Radical Kinship, will be published later this year. He is the subject of Academy Award winner Freida Lee Mock's 2012 documentary, G-Dog. He has received the California Peace Prize and been inducted into the California Hall of Fame. In 2014, the White House named Fr. Boyle a Champion of Change. He received the University of Notre Dame's 2017 Laetare Medal, the oldest and most prestigious honor given to American Catholics. 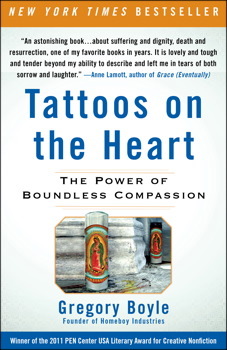 Tattoos on the Heart: The Power of Boundless Compassion is available for purchase at St. Mary's. Barking to the Choir: The Power of Radical Kinship will be available for purchase at St. Mary's when published. The Power of Forgiveness: Good for you. Good for others. Join us for this presentation on the effects of forgiveness on our physical and mental health, our relationships, and our spirituality. Everett Worthington, Ph.D. has just retired as Commonwealth Professor of Psychology at Virginia Commonwealth University. He has published over 37 books and over 400 articles, mostly on forgiveness, marriage, and family topics. He became interested in forgiveness through his practice in couple counseling, and began conducting research on forgiveness in 1990. In the last 15 years, he has studied forgiveness, humility, justice, faith, and a variety of virtues as they relate to positive psychology. He became interest in their relationship after his mother's murder, and the subsequent emotional fallout of dealing with the devastation of a violent murder on his family. Visit Dr. Worthington's website for more information and resources: www.EvWorthington-forgiveness.com. Books by Everett Worthington, Ph.D.
Video featuring Everett Worthington, Ph.D.
Pope Francis has said the Church should be a Maternal Womb of Mercy, a home of joy and love, not a cold institution centered on rules and regulations. In this popular presentation, Brother Mickey will share his colorful paintings and the stories behind them. Each is inspired by the Gospel and the lives of the saints from across time. In these anxious times of fear and division, come feel the healing power of beauty and joy - and a reminder of the gentle and loving maternal side of God. Brother Mickey, an Oblate of St. Francis de Sales, is a popular and engaging presenter who happily travels to conferences, parishes, and retreat centers throughout North America to deliver the good news about deep and often whimsical connections between art and religious faith. He is the author and illustrator of eleven books, many of which have received awards from Catholic publishing associations. His own articles, or articles about him, have appeared in America Magazine, Commonweal, USA Today, The Philadelphia Inquirer and many diocesan newspapers around the country. A native of Philadelphia, Brother Mickey currently lives and works in Camden, New Jersey and is a parishioner at Sacred Heart Church, a parish within the Roman Catholic Diocese of Camden. Presenting: "Dead Man Walking: The Journey Continues"
Sr. Helen has been instrumental in sparking national dialogue on the death penalty and helping to shape the Catholic Church's newly vigorous opposition to state executions. In 1981, Sr. Helen became death row inmate Patrick Sonnier's spiritual advisor. After witnessing his execution, she wrote a book about the experience, Dead Man Walking: An Eyewitness Account of the Death Penalty in the United States, which became a movie, an opera, and a play. Since 1984, Sr. Helen has divided her time between educating citizens about the death penalty and counseling individual death row prisoners. She began to suspect that some of those on death row were not guilty. This realization inspired her second book, The Death of Innocents: An Eyewitness Account of Wrongful Executions, which was released in December 2004. It has been more than thirty years since Sr. Prejean began her crusade and she has witnessed many executions in Louisiana. Today she educates the public about the death penalty by lecturing, organizing and writing. As the founder of "Survive," a victim's advocacy group in New Orleans, she continues to counsel not only inmates on death row, but the families of murder victims as well.